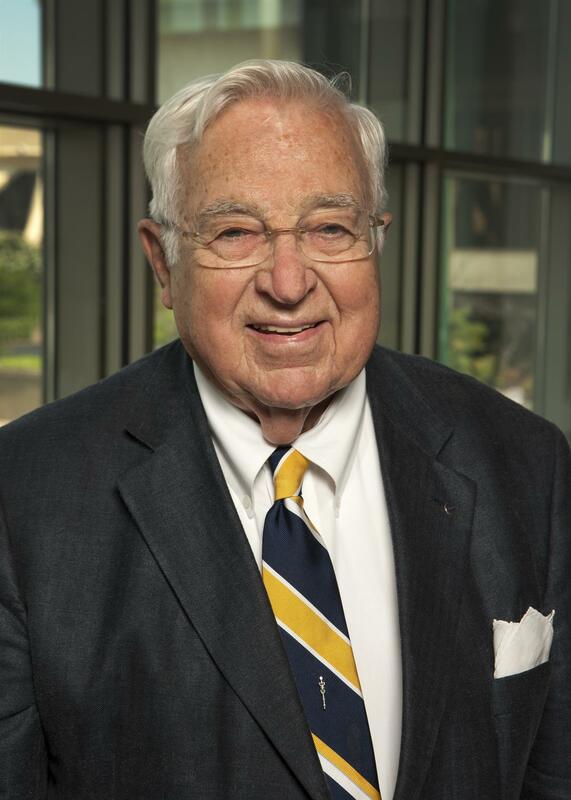 In Memoriam: Harry E. McCoy, Jr.
Harry E. McCoy, Jr. (1922-2019), Norfolk Rotarian for 66 years, died on Wednesday, April 10th. The following mini-biography by Bob Powell was first published in the April 8, 2016 issue of Rotations. A friend of Harry and Martha Lee McCoy for many years, my mother-in-law sums up how people feel about him this way: “Everyone loves Harry. He’s really nice and he makes you laugh.” How true, but I do not want to get ahead of myself so let’s go back to the beginning. Harry arrived as a newborn babe in Norfolk on July 28, 1922, the child of Harry E. McCoy and Emily Hope McCoy. He attended Blair Junior High School and graduated from Maury High School. He met his wife Martha Lee in eighth grade at Blair but they did not start dating until 1937 when both were classmates at Maury. In high school Harry was advertising manager for the yearbook, golf team manager and a member of the Hi-Y Club and Alpha Alpha Pi. After graduation Harry headed to the University of Virginia and Martha Lee went to Sweet Briar College. At an early age Harry developed a great work ethic. His father passed away during the Great Depression when Harry was nine years old and in fourth grade. Finances were tight so Harry found jobs to earn money. During college he was active in several student activities and societies including V-Club and Skull & Keys. He also managed the cross-country track team and student accounts for a boarding house in addition to having other odd jobs. Harry was president of Chi Phi fraternity, a Greek social fraternity founded at UVA in 1859. With the outbreak of World War II on December 7, 1941, Harry enlisted in the U.S. Naval Reserve in 1942. He increased his UVA course load with the hope of graduating before being called to active duty. When the call came in mid-1943, he was four hours short of graduating, but in January 1944 UVA granted him a political science degree. Soon he and Martha Lee married. By June 1944 Harry was a Navy ensign and a graduate of the Naval Reserve Midshipman School at Notre Dame University. Harry was commissioned as a civil engineer based on his experience as a time-keeper on a construction project. This resulted in his assignment to the SeaBees at Camp Peary, Virginia. Harry’s assignments included: 3rd Naval District Headquarters in New York City training in cargo operations; Camp Endicott in Rhode Island teaching at a military government school; Port Hueneme, California, U.S. Army Rocky Mountain Arsenal Chemical Warfare School in Denver for instruction in poisonous gas handling; 4th Special SeaBee Battalion as a cargo officer in Okinawa. After serving in Guam organizing support companies for cargo operations, Harry returned in 1947 to the U.S. and inactive duty. He later transferred to U.S. Naval Intelligence and remained in the Naval Reserve with monthly meetings and two-week annual active duty until being discharged as a lieutenant in 1955. That was the year Harry joined the Rotary Club of Norfolk on April 14. He remains one of our club's longest-tenured and most devoted members and was one of the driving forces behind starting our club's charitable endowment in 1992. Harry entered the UVA Law School under the G.I. Bill in mid-1946, passed the 1947 bar exam and was admitted to practice on January 10, 1948. In June of that year he received his degree from the School of Law at UVA and started his legal career with Hughes, Little & Seawell where several of the partners had been his customers when he sold magazines from age 7 to age 14. His talents were quickly recognized and within two years he became a junior partner. Two years late, the elderly partners in the firm died, the firm reorganized and Harry became the firm manager. In only five more years (in 1957) one partner died and another became a judge leaving Harry as the sole remaining partner when he was only nine years out of law school. Harry grew the firm to over 30 attorneys with a sizeable paralegal and support staff. In 1980 younger attorneys made Harry what he calls “an offer he could not refuse,” and he accepted a buy-out and retired. During his law tenure Harry concentrated on admiralty and maritime area representing ship owners, operators, charterers, insurers and mutual underwriting syndicates such as Lloyd’s of London. This led to extensive business and friendship contacts and affiliations in the U.S. and around the world. He traveled to England, Scandinavia, Greece and other countries where clients were located. His firm expanded into corporate, finance, tax, estate planning and administration, business development and administration, and personal counseling. Harry also had extensive litigation experience in both state and federal trial and appellate courts in Virginia, North Carolina, Maryland and Delaware. He was the only civilian attorney participating in the 18-day U.S. Navy Court of Inquiry into the 1950 grounding of the USS Missouri as it headed out of Hampton Roads to the Chesapeake Bay. The incident resulted in the court martial of the captain. For several years Harry was a visiting lecturer at the UVA School of Law teaching the admiralty seminar. He also lectured at a Tulane University Admiralty Law Institute and at an American Bar Association Annual Meeting. During a maritime law trial in Federal Court, Harry’s opponent got cute during his closing argument. He told the jury that he knew Harry McCoy and then went through all the points he knew Harry would make in defense of the case during his closing argument that would follow. The opposing attorney told the jury that he had reasonable, if not determinative, responses to each of the points that Harry would make. Rather than tell the jury what those responses were, he said he would wait until Harry made his argument and he would then use his rebuttal time to explain why Harry’s points were not well taken. He concluded his closing argument. Harry then told the Court that he waived his opportunity to make a closing argument. When his opponent stood to do his rebuttal, Harry stood and objected, telling the judge there was nothing to rebut since he had waived his closing argument. The judge agreed, the jury was then sent out to deliberate and returned a verdict in Harry’s client's favor. The attorney said there are many other stories that demonstrated Harry's quick mind and keen wit. He calls Harry a wonderful mentor and friend and says “we will never forget his generosity and caring.” This is a good summary of Harry McCoy who always demonstrates the true Rotarian spirit and attitude.